Osona Terra is an association of peasants and artisans the Osona region. It is a group of producers who has joined to offer local products which enhance the value of the varieties of food, of native animal breeds, milk, cheese, sausages, bread, beer and other food elaborated following the artisan processes, and at the same time, recovering traditional recipes. Osona Tierra offers products with the guarantee of quality, proximity, and excellence of tastes and flavors. They are bacon butchers, butchers, brewers, bakers, meat farmers and milk farmers, cold meat producers, ratafia producers (typical Catalan liqueur) who join together to give value to the local first quality products. They all share the love for the land and the passion for good products. They strive for excellence by offering authenticity and uniqueness. The popular topic says that everything comes back. At the dawn of this second decade of the twenty-first century, the demand for local products returns with more strength than ever. When it seemed that globalisation of markets should lead to the end of small producers, a recovery movement of unpredictable scope has begun. Hard to believe but true. whether in the United States, the Scandinavian countries, Italy, France or Catalonia itself, initiatives that value the varieties of vegetables and native animals breeds, milk, cheese, sausages and bread processed following artisan processes and recovering traditional recipes. The strong emergence of a new profile of a responsible and committed consumer who asks and buys products with the guarantee of proximity blinds the circle. Osona, in this context, is back to the front. As it had happened with ‘Osona Cuina’ (Osona Cuisine), leading the movement of local cooks more than twelve years ago, Osona Terra represents a step forward and a role model. 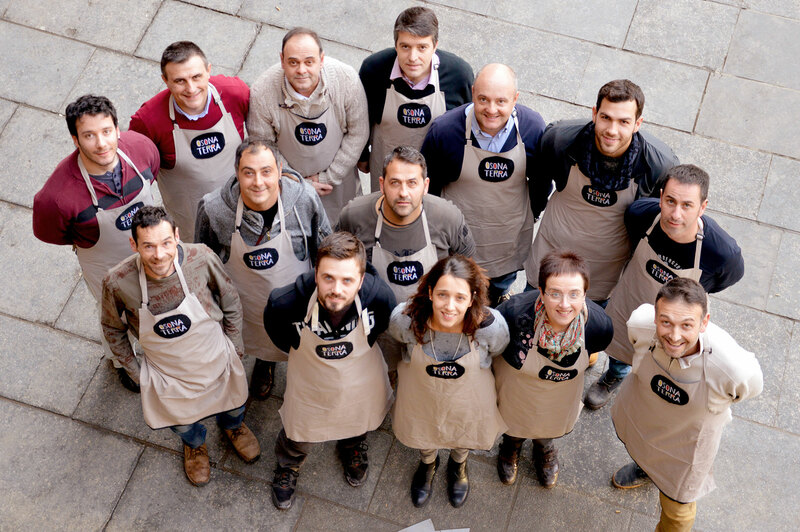 With the support of the Regional Council of Osona, a group of peasants, artisans and people from various jobs related to food, decided to join forces in 2010 with the aim of creating a quality label for the small great products of the region of Osona. Breeders of meat and milk, cheese makers, butchers and cold meat producers, bakers, brewers and ratafia producers (typical Catalan liqueur) share their best to promote Osona abroad and strengthen the image of gastronomy land that the region enjoys. Osona Terra walks alone. It is an open association for all those producers of the region who share the love for the land and the passion for good products. They strive for excellence offering authenticity. Let them be able to share common traits, making them into values of uniqueness. Hoping to be able to create great works for many years.